GOOD TO KNOW: White corn meal = Best corn bread. Evah. It’s all about the blonde! So tonight we had easy fish stew for dinner and I decided to make the usual corn bread to accompany. 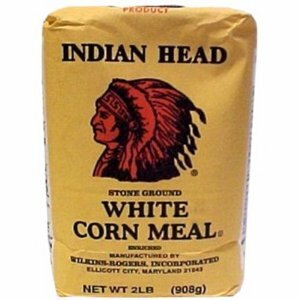 Imagine my surprise when I retrieved the old reliable Indian Head corn meal from the pantry only to find I’d picked up white corn meal rather than the usual yellow during my last trip to Fairway! Anyways, I was feeling far too lazy to run down the the Las Americas bodega to get the usual yellow product, so I threw caution to the wind, poured another glass of wine and decided to roll with the white stuff. One of these years I’m going to get a working camera to share the fruits of my labors, but until then, you’ll just have to take the word of the Slattern family that the white cornmeal makes a far superior corn bread. Lighter, finer and altogether more pleasing. It’s not difficult to make — just use the recipe on the back of the sack. If you’re too lazy to click the link, read on to see the recipe just as it appears on their site. Foolproof. Preheat oven to 425 degrees. Combine corn meal, flour, sugar, baking powder and salt in a bowl. Mix oil, egg and milk together and add to dry ingredients, mixing until batter is uniform. Bake in a greased 9”x9”x2” pan for 20-25 minutes. Pour corn meal batter into greased or line muffin tins, filling about 2/3 full. Bake at 425 degrees for 15-20 minutes. Makes 12 muffins. For a sweeter, moister corn bread or muffin, make these changes to the recipe above: Use 2/3 cup milk, ½ cup sugar, ½ cup oil and 2 eggs. Reduce the heat to 400 degrees. Bake for 20-25 minutes. Posted on January 17, 2012, in Good to know and tagged Bake, Bread, Cornbread, Cornmeal, Drink and Food, Humor/Commentary. Bookmark the permalink. 17 Comments. I missed this the first time around. Probably because it pre-dates my history as a blogger. WordPress apparently likes it too. What posts come up under my name when I like your stuff? I want to try this cornbread. The cornbread is delicious and makes the family feel like you’ve actually put some effort into the meal. Try it with my Easy Fish Stew. As for names coming up with likes, I’m sorry to have to reveal my incompetence, but I have absolutely no idea what you’re referring to. I get emails when some people like a post. Huh. I don’t. Clearly you have taken my seat at the cool table for lunch. This is part of the reason that I have 16,000 unread messages in my inbox. Like all of the cool people do. I was actually incoherent with rage, which I am sorry to report bears a striking resemblance to inebriation. Thanks for stopping! I am eating the Easy Fish Stew right now and it is REALLY GOOD. I’m a southern girl and I’ve been using yellow cornmeal for a lot of years. I’ll give it a try. You won’t regret it! I hope. White cornmeal is always betta…ever’one in the south do alreada know dat! White grits, dy is betta too. You just been livin in da north fa too long now, ya know! You know, Mrs Deen, you could post under your own name….anyways, I’m just a dumb girl from Maine, and corn bread is a like mysterious ethnic food for me. The Kitchen Slattern never ceases to amaze! …or increase in size unfortunately. Thanks for reading!